There are a variety of cages. What you choose will depend mainly on locations of the cage or rabbit hutch. Visit the equipment page to see what goes IN the cages! All outdoor rabbits will need a safe and well designed hutch to keep predators away, no matter what type of cage you choose! Rabbits are active animals, they like to run around, you should choose a cage based on the size of your rabbit. My guideline would be to be able to have a cage AT LEAST 6 times the size of the rabbit. DO NOT GET THIS. While these are suitable for guinea pigs or hamsters who DO NOT have hair on the bottom of their feet, rabbits should NOT have a cage with a flat bottom where they walk among wood chips/hay, and their own poop. Rabbit poop tends to be wetter than small pets, so it will easily clump and stick to the bottom of the feet of rabbits. The hair on their feet will hold it there and can dry on. This will very easily irritate their feet, cause infections, and skin problems for the rabbits. You MUST get a cage with a wire bottom that keeps them off of the tray!! 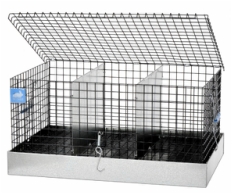 These cages can be bought online or at many pet stores. They usually have one or two door openings, and a wire bottom with a tray underneath which is super important for the rabbits to not be walking in their own excrement. Some may come with pee guards (see below) and some may come with legs or wheels to stand off the ground. Some cages are even built to be able to stack them as you add more rabbits. What you choose is totally up to you! 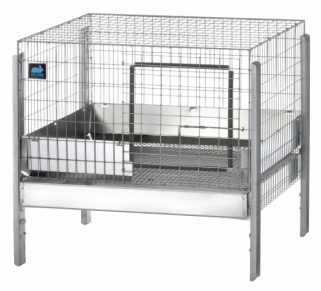 These cages DO NOT have protections from the weather, so if you use this for an outdoor rabbit, you will need to build a protected hutch for the rabbits. Pet stores sell fancy versions of these, but you may have to hunt for them. You can order the stackable ones online at KW cages. For fancy pet rabbits, some choose to buy a more expensive wooden hutch sort aesthetics. The hutch should have a wire floor and a metal tray on the bottom, hidden by a wooden facade. They are cute for indoor rabbits. For outdoor rabbits, while the hutches sometimes have walls or a roof, you will need a wider roof, to block out weather like rain that could blow in from the sides. PLEASE see below for the "Hutch Building" category. While a nice wooden hutch is aesthetically pleasing, it WILL NOT do the job to keep out predators or the weather. 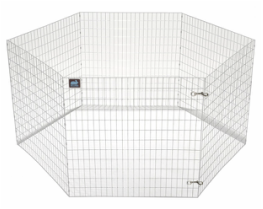 This is the cage system that is most time and health effective for large breeders. This system is for outdoor rabbit hutches only. You will either need to build your own or buy the set from a company like KW Cages. The cage hangs on hooks installed into a wall and pieces above it to keep it level. Instead of trays, the cages hang over backward sloped panels that end in a gutter. Those gutters can be slightly sloped to one side and empty into a large tube that takes excrement down and out to a compost pile outside the rabbit hutch. The reason many breeders are choosing this system is because all you have to do to clean ALL you rabbit trays is use a hose! You spray downward on the bottom panels which washes everything into the gutter and eventually, out into the compost pile! No heavy lifting, no spilling, no back pain, and no worries about build up in a tray because the slope is so deep, it keeps the poop away from the wire bottom! This is the system my family used in our prime of rabbit raising. Believe me, it's worth the extra money! We saved on costs by making ours. If you have an outdoor rabbit, you will need to protect it. You can keep your rabbits in a barn but you need to ensure airflow throughout the area (screened windows you can open on opposite sides of the barn so air can blow through). My best advice is to look around on google and ask other rabbit breeder near you about building the best hutch in your backyard. Breeders in your area will know what types of predators to look out for and how to best protect your rabbits. We had a few throughout the years. Our smallest one was 6 cages against one wall and wooden sides. there was a roof on top and a tarp that draped from the front. During the day, we could roll up the tarp so the rabbits had fresh air and sunlight. At night and in the rain, we would let the tarp hang down and protect the rabbits. Most importantly, we had a tall exercise pen surrounding the whole thing. For this, we just had simple metal cages with trays stacked up using the stacking legs. My second, larger, hutch, had a professional set up. My mother and 4-H leader built the whole thing by hand! Four main posts were dug and cemented into the ground. They build a platform from 2x4s about 4 feet off the ground and then put up walls and a sloped roof on top. Inside, the cages were hung from planks and we used wood panels for the slope and coated them in plastic that would protect the wood. Our system didn't use gutters, the poop would just fall down the back wall to the lowest level where a forward slope would move it forwards, we could then spray it out into a hole in the wall that would drop it all into a compost pile! As you can see, there are a ton of ways you can build a custom hutch based around your needs and sizes. While some animals are good at peeing downward in a squat.... rabbits are not great... Many females won't have any problems, but males are known for spraying. This is not only a problem for your walls and floors, but also for rabbits in cages next door. To protect your floors and walls, many cages have pee guards, a metal wall around the bottom section of the cage that just catches the urine and lets it drip down into the tray. If you continue to have a spray problem past the guards, use a piece of plexi-glass to block the walls! Cut to size and drill a few holes on the sides, use C hooks to attach it to the inside of the cage. (You may have to take off the top of the cage to get the plexi-glass in and then reattach it.) Plexi-glass does hinder air flow, so try not to do this on all sides, just choose one or two sides that are most effected by spraying, such as just the back or the left & right side. For travel to and from rabbit shows, there are special travel cages you can use. They're just like a standard wire cage with a tray but they're smaller so the rabbit cannot jump around. Many travel cages hold multiple rabbits for people who attend shows, but these cages may need to be bought online rather than in a pet store. Cages tend to have 1-4 compartments. Some people choose to use these, other's don't. It's all up to you. This metal pen can go anywhere. Just set it up and put the bunny inside. Be careful where you put the pen and make sure there are no toxic plants inside or around the pen. The rabbits will nibble at the grass and you want them to be pesticide free yet pest free.